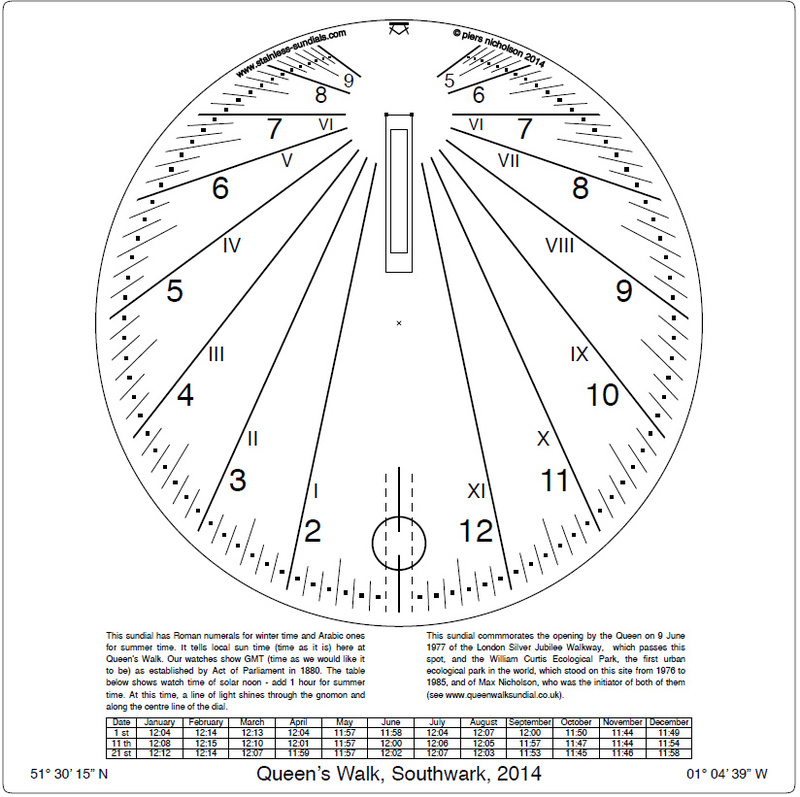 The Queens Walk sundial was fixed in position on Wednesday 21 January 2015. 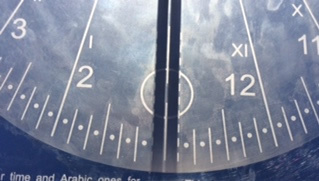 The unique feature of these Spot-On sundials is the "line of light" which appears each day at the exact time of solar noon. 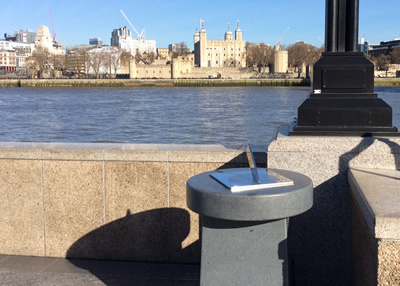 This enables the sundial to be set up accurately to true North, just using the published tables for the time of solar noon. Once set to true North, the sundials require no further adjustment. When Summer Time comes, the time is read with the Arabic numbers, and in winter, with the Roman numerals. This project was conceived in early 2013 to commemorate two features of this site on the bank of the River Thames. It is a very open site, which gets sunshine almost the whole day long, and is thus ideal for a sundial. 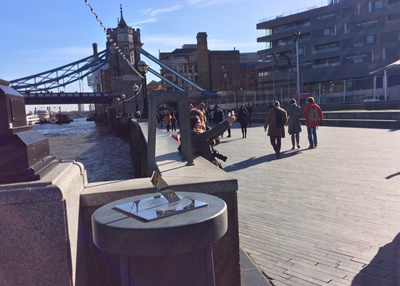 The Jubilee Walkway was started in 1977 to commemorate the Silver Jubilee of Her Majesty The Queen. The walkway includes this section of Queens Walk running on the south bank between London Bridge and Tower Bridge. Click here for information and maps for the whole Walkway. The William Curtis Ecological Park was the first urban ecological park in the UK. It was developed from a disused lorry park in 1978, and returned to the site's owners in 1983. 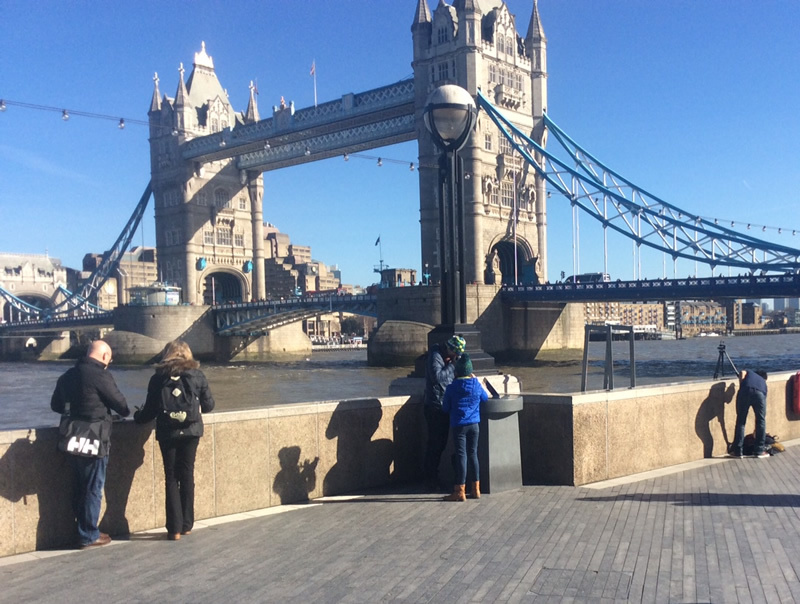 The site is now occupied by City Hall and the Potters Field Park. 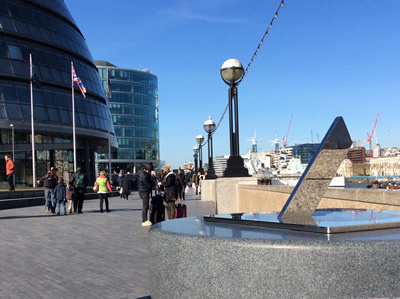 The sundial also commemorates Max Nicholson, who initiated both of these projects. 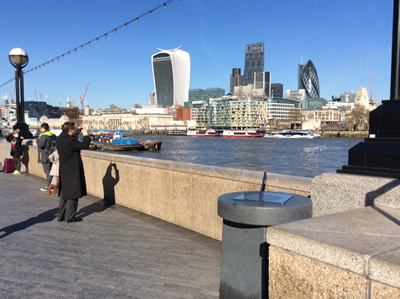 Looking across the river to the tall buildings of the City of London, including the new "walkie-talkie"
The stonework cladding to the existing mini-plinth and giving it a circular top, was fixed in mid-October 2014. Please click here for a map showing the position of the Queens Walk sundial (and also of the Millennium sundial of the Tylers and Bricklayers Company which was erected in 1999, and is 1.2 miles away by way of the south bank and the Millennium footbridge Both were designed by Piers Nicholson.